Becky just returned from leading our Under-18s Trip 2015, taking a group of dedicated and enthusiastic young people on their first overseas volunteering experience. 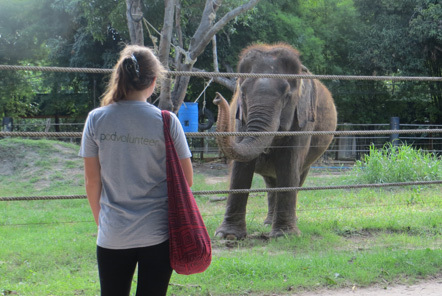 The team volunteered for two weeks at the Elephant Care & Wildlife Rescue project in Thailand. "I arrived at the airport to a rather nervous looking bunch of volunteers, arriving with their parents from all over the country; this was the first time they had met each other, the first time they had met me, and for many, the first time they have travelled alone. It was definitely understandable that there were some nerves! However after a few moments in the queue for check-in, the chatter started. The team realised they had so much in common; they all loved animals, they all loved volunteering and they all loved adventures! 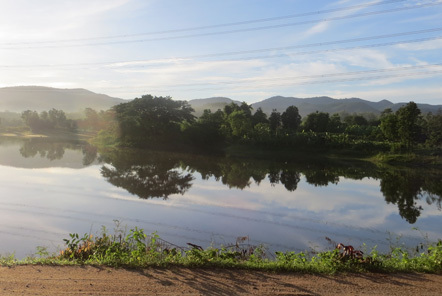 We travelled onto the centre by mini-van, out of the hustle and bustle of Bangkok and into the rolling countryside and arrived at the Elephant Care & Wildlife Rescue project in time for lunch. The first day is all about getting our bearings and trying to sleep off some of the jet-lag. After a tour of the centre itself – now so large that it takes three hours – we settled down for a quiet evening. 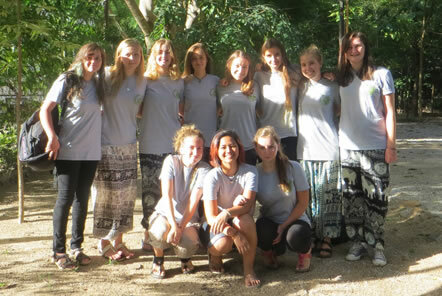 The U18 Team complete a full two week placement at the centre, one week Elephant Care and one week Wildlife Rescue. This means that volunteers are placed on one schedule for their first week and one for the second – and have a chance to experience both roles. This is a great opportunity for volunteers looking to pursue a career with animals. Every morning we were up at 6am ready to find out which teams the volunteers were in. Volunteers are allocated to a group with a leader and are assigned to a certain set of animals or a specific elephant enclosure. So for Wildlife Rescue volunteers you may be allocated to Primates 1, Primates 2, Bears 1, Bears 2 or ‘Other Wildlife’. As the Wildlife role is so varied, volunteers follow a brilliantly devised rota of activities which changes every day. This is your team allocation for the day and it’s rotated to allow volunteers to gain experience with a variety of animals. When on the Wildlife Rescue role, volunteers get involved huge variety of jobs from scrubbing bear pools, sweeping the nocturnal enclosures, water rounds or getting creative with enrichments. The pot-bellied piglets were a particular favourite with the team who were very fond of a belly scratch with their dinner. Another favourite activity was hiding food for the bears as part of their enrichments. Similarly the Elephant Care volunteers are allocated to an enclosure, sometimes this may be one enclosure with only one elephant whilst other times it may be one of the large open enclosures with 3-5 elephants. With the very new arrival of 9 month old baby Pin, she was the celebrity of the moment and all the volunteers were hoping to be working with! Elephant volunteers ensure that there is drinking water and food in the mornings, making fresh banana balls for the elephants’ breakfast. Banana balls contain fibre, vitamins and minerals and any medication that the elephants require and depending on the elephant, sometimes these can be hand-fed. Next up would be first round of composting, clearing the enclosure of dung and banana tree debris. Depending on which elephant you’re working with, the team also had the opportunity to walk with the elephants or give the elephant a shower to help to keep them cool. One additional part of the Elephant Care role is harvesting banana trees or pineapple plants, an activity which happens twice per week. 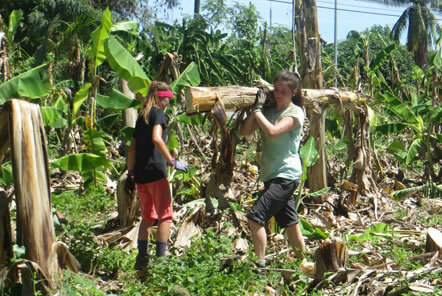 The U18 Team headed out to a neighbouring farm on four occasions to collect banana trees for the elephants, the elephants love crushing the trunks and eating the juicy middle part of the tree. The harvest is incredibly hard work but the sense of achievement on the truck on the way home, and the cold shower afterwards, are the best feelings in the world! The days were long and hot but incredibly rewarding. 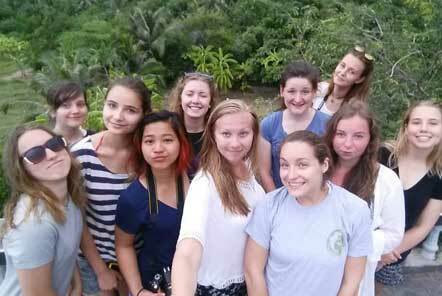 In addition to all our hard work, we were also lucky enough to have two days’ off to explore the local area! For our first day off – midway through week one - we visited the local town of Cha Am and had some time to relax on the beach. At dusk we visiting a viewpoint for the infamous local bat cave where, at around 6pm, millions of bats fly out of the cave into the night sky. 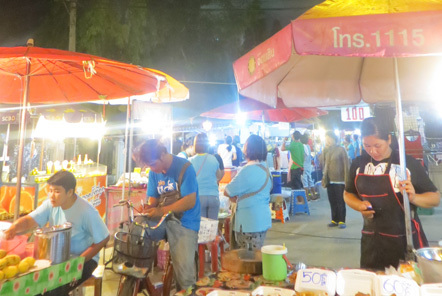 Following this amazing site we travelled onto the local Night Market in Cha Am where we tried some local delicacies. For our second day off we opted to visit a local hotel and spa which had a swimming pool and restaurant. With sun loungers, ice cream and a treatment room we were definitely re-charging from all the hard work! In the evening we visited Hua Hin Night Market which is more of a tourist hot spot than Cha Am – the perfect place for the team to pick up gifts and souvenirs as well as some mango sticky rice! The 2015 group came from a diverse mix of backgrounds and locations but they worked together as a formidable team in their two weeks. The placement is challenging but the team were incredibly hard working and both staff and other volunteers at the centre commented on this. By the time we set off back home, the project had started to feel like a family – we said some tearful goodbye’s to the animals, the staff and other volunteers and set off back to Bangkok. It has been a genuine pleasure to have been Team Leader to a bunch of very dedicated young people and it was also very exciting for me to have the opportunity to re-visit the centre, my third time volunteering at the Elephant Care & Wildlife Rescue project. We look forward to meeting our eager young volunteers for 2016!"